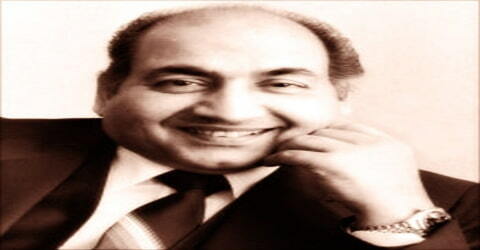 Mohammed Rafi – Indian playback singer and most influential singers of the Indian subcontinent. One of the greatest playback singers in India, Mohammed Rafi was born on December 24, 1924, Kotla Sultan Singh, near Amritsar, Punjab, British India. Rafi was notable for his voice, versatility, and range; his songs were varied from fast peppy numbers to patriotic songs, sad numbers to highly romantic songs, qawwalis to ghazals and bhajans to classical songs. He was known for his ability to mold his voice to the persona and style of an actor, lip-syncing the song on screen in the movie. Rafi was a legendary playback singer who recorded more than 25,000 songs in a career spanning almost 40 years. Rafi was blessed with such versatility that he could sing romantic numbers, sad songs, funny songs and ghazals, all with the same heartwarming soulfulness. Voted as “Indian Cinema’s Greatest Voice”, it is no surprise that even today he remains one of India’s most listened to singers decades after his untimely death! Over a long and productive singing career that spanned over three decades, the singer recorded thousands of songs, several of which still remain etched in the memories of Indian film lovers. He had a strong command over the Hindi language and had the ability to modulate his voice and tone to suit the personalities of the actors he was singing for. Over his career, he sang for many of Bollywood’s superstars like Dev Anand, Shammi Kapoor, Dilip Kumar, and Sunil Dutt. Along with his solos, he was also very famous for singing duets with the leading female singers of his time like Lata Mangeshkar and Asha Bhosle. His contribution to the Hindi film industry has been fabulous and perhaps no singer till date has managed to capture the hearts of fans the way Mohamed Rafi has. Rafi was well-known for his versatility as he gave his voice to songs ranging from classical numbers to patriotic ones, sad songs to romantic numbers, qawwalis to ghazals and bhajans. For almost twenty years, Rafi was the most sought after singer in the Hindi film industry. In his illustrious career, he received six Filmfare Awards and was honored with the National Film Award once. Besides Hindi, he sang in several Indian languages including Konkani, Bhojpuri, Bengali, Odia, Punjabi, Marathi, Sindhi, Telugu, Kannada, Maithili, Gujarati, Magahi, and Urdu. Apart from Indian languages, he gave his melodious voice to songs in English, Arabic, Persian Sinhalese, Creole, and Dutch languages. Rafi received six Filmfare Awards and one National Film Award. In 1967, he was honored with the Padma Shri award by the Government of India. In 2001, Rafi was honored with the “Best Singer of the Millennium” title by Hero Honda and Stardust magazine. In 2013, Rafi was voted for the Greatest Voice in Hindi Cinema in the CNN-IBN’s poll. 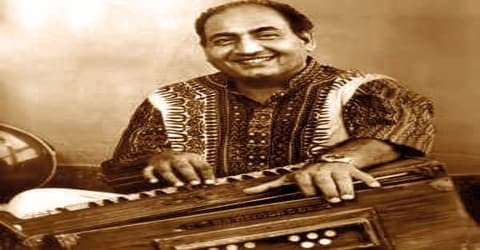 Mohammed Rafi was born on December 24, 1924, as the fifth of six sons of Hajji Ali Mohammed and his wife Allahrakhi Bai, in the village of Kotla Sultan Singh in United Punjab Province of British India. Rafi, whose nickname was Pheeko, began singing by imitating the chants of a fakir in the streets of his native village Kotla Sultan Singh where his family lived. Rafi’s father moved to Lahore in 1935, where he ran a men’s salon in Noor Mohalla in Bhati Gate. Rafi learned classical music from Ustad Abdul Wahid Khan, Pandit Jiwan Lal Mattoo and Firoze Nizami. Rafi started giving public performances as a teenager; his first performance was as a 13-year-old. In 1941, Rafi, under Shyam Sundar, made his debut in Lahore as a playback singer in the duet “Soniye Nee, Heeriye Nee” with Zeenat Begum in the Punjabi film Gul Baloch (released in 1944) under music director Shyam Sunder. In that same year, Rafi was invited by All India Radio Lahore station to sing for them. He made his Hindi film debut in Gaon Ki Gori in 1945. Mohammed Rafi was first married to his cousin Bashira Banu. But the marriage suffered due to the political tensions during the partition in 1947. Bashira Banu refused to accompany Rafi Saab to India after witnessing the horrors of the riots. She remained in Lahore, now in Pakistan and their marriage ended. His second marriage was to Bilquis. He had a total of seven children and was very much a family man. His first son Saeed was from his first marriage. Rafi’s hobbies included playing badminton, carrom, and flying kites. He was a very humble person with simple interests. He was dedicated to music and practiced regularly. A public performance that Rafi gave in Lahore when he was about 15 proved to be a turning point in his life. In the audience was Shyam Sunder, an acclaimed composer who was impressed with Rafi’s talent and invited him to Bombay (now Mumbai) to sing in films. Rafi recorded his first song in Lahore for the Punjabi film Gul Baloch (1944). In Bombay, Rafi had his first physical role in Laila Majnu (1949). His earliest recordings in Hindi, also in Bombay, were for films such as Gaon ki gori (1945), Samaj ko badal dalo (1947), and Jugnu (1947). The composer Naushad recognized the budding singer’s potential and gave Rafi his first solo song assignment, “Tera khilona toota balak” in Anmol Ghadi (1946), and later the song “Is duniya mein ae dilwalo” in Dillagi (1949), which proved to be a milestone in his singing career. Meanwhile, Mohammed Rafi started singing for top music directors like Naushad and Shyam Sunder. His work with Naushad continued through the 1950s and 1960s. Together they worked in films like Pehle Aap (1944), Anmol Ghadi (1946), Shahjahan (1946), Dulari (1949), Deedar (1951), Deewana (1952) and UranKhatola (1955). Rafi Saab catapulted into stardom after his work in the film Baiju Bawra under the direction of Naushaad. The semi-classical bhajan ‘Man Tarpat Hain Hari Darshan Ko Aaj’ from the film showed the world Mohammed Rafi’s caliber as a singer. The two collaborated for another magnum opus Mughal-e-Azam in 1960. In 1948, after the assassination of Mahatma Gandhi, the team of Husanlal Bhagatram-Rajendra Krishan-Rafi had overnight created the song “Suno Suno Ae Duniyawalon, Bapuji Ki Amar Kahani”. He was invited by the Indian Prime Minister, Jawaharlal Nehru, to sing at his house. In 1948, Rafi received a silver medal from Jawaharlal Nehru on Indian Independence Day. During the 1950s and 1960s, Rafi enjoyed great fame and glory as he became the undisputed voice of the superstars Dev Anand and Guru Dutt. It was the songs for movies like ‘Pyaasa’ (1957) and ‘Guide’ (1965) that made Rafi a celebrity. He formed a very successful partnership with Shankar Jaikishan which produced many melodious and super hit songs. Some of the partnership’s most successful songs are ‘Teri Pyari Pyari Surat Ko’, ‘Baharon Phool Bharsao’ and ‘Dil Ke Jharokhe Mein’. Rafi’s peak came during the 1960s when he provided the voice for such influential Indian actors as Shammi Kapoor, Dilip Kumar, Rajendra Kumar, Dev Anand, Shashi Kapoor, Raj Kumar, and Kishore Kumar. Although an argument with India’s leading playback singer, Lata Mangeshkar, in the late-’60s resulted in a six-year period during which there were no duets, Rafi and Mangeshkar eventually settled their differences and renewed their collaboration. Rafi Saab became the voice behind leading actor Dev Anand all through the 1950s. He did Dev Anandji’s playback for films like Kaala Paani (1958), Bambai Ka Babu (1960), Nau Do Gyarah (1957), Tere Ghar Ke Samne (1963) and Guide (1965). At the same time, he worked on the musical creations of Sachin Dev Burman. The Dev-Rafi-Burman trio gave the Hindi film industry some truly unforgettable songs like ‘Diwana Hua Badal’, ‘Dilka Bhanwar Kare Pukar’, ‘Achhaji main hari’ with Asha Bhosle and ‘Khoya Khoya Chand’. Mohammed Rafi and S.D. Burman created magic over and over all through the 50s, 60s, and 70s. Burman used Rafi Saab’s voice for almost all of his leading men including Dev Anand, Guru Dutt, Rajesh Khanna, and Amitabh Bachchan. Rafi Saab’s voice serenaded the country with romantic numbers like ‘Teri Bindiya Re’ and ‘Gun Guna Rahe Hai’. Rafi worked with Burman in 37 films, including Pyaasa (1957), Kaagaz Ke Phool (1959), Kala Bazar, Nau Do Gyaran, Kala Pani, Tere Ghar Ke Samne (1963), Guide (1965), Aradhana (1969), and Abhimaan (1973). Rafi’s talents and his versatility to adjust his voice to suit any actor he sang for made him an extremely popular playback singer. However, during the 1970s he faced stiff competition from the new singer on the block, Kishore Kumar. But professional rivalry apart, the two singers also produced many duets. 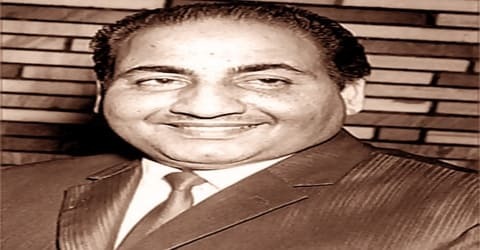 Rafi worked with legendary music director O. P. Nayyar on several occasions and Mr. Nayyar went on record saying that without Mohammed Rafi he would not have reached the pinnacle of success. He paired the voices of Mohammed Rafi and Asha Bhonsle for multiple successful projects like NayaDaur (1957), Tumsa Nahin Dekha (1964) and Kashmir Ki Kali (1964). Songs like ‘Ude Jab Jab Zulfein Teri’, ‘Tumsa Nahin Dekha’ and ‘Deewana Hua Badal’ made a permanent place in the hearts of the Indian audience. Rafi’s voice had a phenomenal range that composers explored to great advantage. His oeuvre included such classic songs as “Madhuban Mein Radhika nache re” in Kohinoor (1960) and “O Duniya Ke rakhwale” in Baiju Bawra (1952), such ghazals as “Suhani Raat dhal chuki” in Dulari (1949) and “Chaudhavin ka chand” in the eponymous 1960 film, stirring patriotic songs including “Jahan daal daal par” in the 1965 film Sikandar-e-Azam, and such light numbers as the rock-and-roll-inspired “Aaja Aaja main hoon Pyaar Tera” in Teesri Manzil (1966). His last recording was “Tu kahin aas paas hai dost” for the 1981 film Aas Paas. Rafi also formed successful collaborations with the leading female singers of his times, the sisters Lata Mangeshkar and Asha Bhosle with whom he sang a number of super hit duets that are popular even today. In 1962–1963, the popular female playback singer Lata Mangeshkar raised the issue of playback singers’ share in the royalties. Recognizing Rafi’s position as the leading male playback singer, she wanted him to back her in demanding a half-share from the 5% song royalty that the film’s producer conceded to select composers. Rafi refused to side with her, stating that his claim on the film producer’s money ended with his being paid his agreed fee for the song. 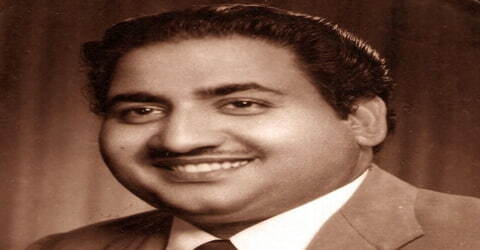 Rafi argued that the producer takes financial risk and the composer creates the song, so the singer does not have any claim over the royalty money. Lata viewed his stand as a stumbling block on the royalty issue and stated that it is because of the singer’s name also that the records get sold. This difference of opinion subsequently led to differences between the two. During the recording of “Tasveer Teri Dil Mein” (Maya, 1961), Lata argued with Rafi over a certain passage of the song. Rafi felt belittled, as music director Salil Chowdhury sided with Lata. The situation worsened when Lata declared that she would no longer sing with Rafi. Rafi stated that he was only so keen to sing with Lata as she was with him. The music director Jaikishan later negotiated a reconciliation between the two. In an interview given to The Times of India on 25 September 2012, Lata claimed to have received a written apology from Rafi. However, Shahid Rafi, Mohammad Rafi’s son, rebuffs the claim, calling it an act to dishonor his father’s reputation. Another successful music director duo Laxmikant Pyarelal produced great work with Mohammed Rafi. Their association started with the film Parashmani in 1963 and continued through glorious projects like Dosti (1964), Mere Humdum Mere Dost (1968), Khilona (1970) and Anari (1975). Together they recorded 369 songs, which was the highest number of songs Rafi Saab recorded for a music director. They produced wonderful songs like ‘Na Ja Kahinab Na Ja’, ‘Patthar K Sanam’, ‘Yeh Reshmi Zulfein’, ‘Koi Nazrana Lekar Aya Hu’ and ‘Aye Din Bahar Ke’. Raafi Saab won the Filmfare Award in 1964 for the song ‘Chahoonga Main Tujhe Saanjh Savere’ from the film Dosti. Some of Rafi’s hit songs of the early 1970s were with music directors like Laxmikant-Pyarelal, Madan Mohan, R.D. Burman and S.D. Burman. These include “Tum Mujhe Yun Bhula Na Paoge” (a signature song of Rafi in 1971), from Pagla Kahin Ka; “Yeh Duniya Yeh Mehfil” from Heer Ranjha (1970); “Kaan Mein Jhumka” from Sawan Bhadon; “Jhilmil Sitaron ka” from Jeevan Mrityu (a duet with Lata Mangeshkar, 1970); “Gulabi Aankhen” from The Train (1970); “Yunhi Tum Mujhse Baat” from Sachaa Jhutha; “Yeh Jo Chilman Hain” and “Itna to Yaad Hain Mujhe” from Mehboob Ki Mehndi (1971); “Mera Mann Tera Pyasa” from Gambler; “Chadti Jawani” and “Kitna pyara wada” from Caravan (1971); “Chalo Dildar Chalo” from Pakeezah (1972); “Chura Liya Hai Tumne” from Yaadon Ki Baarat (a duet with Asha Bhosle, 1973); “Na Tu Zameen Ke Liye” from Dilip Kumar’s movie Dastan (1973); “Tum Jo Mil Gaye Ho” from Hanste Zakhm (1973); “Teri Bindiya Re”, from Abhimaan (1973) and “Aaj Mausam Bada Beimaan Hai” from Loafer (1973). Rafi made a comeback as the leading singer in mid-1970s. In 1976, Rafi sang all the songs for Rishi Kapoor in the hit film Laila Majnu. Rafi went on to sing many more songs for Rishi Kapoor in the subsequent hit films, including Hum Kisise Kum Naheen (1977), and Amar Akbar Anthony (1977). Rafi sang for many successful films in the late 1970s and the early 1980s many of whose hit songs were dominating the charts in the late 70s on radio programs such as Vividh Bharati, Binaca Geetmala and Radio Ceylon. Rafi was one of the most courteous and professional singers of all time and his altruistic nature was revered by all his contemporaries. During the 1970s Rafi faced stiff competition from Kishore Kumar who emerged as a leading singer post-Aradhana in 1971. He recorded fewer songs in the early 70s but made a huge comeback winning both Filmfare Awards and National Award in 1977 for the song ‘Kya Hua Tera Wada’ from the film Hum Kisi se Kum Nahin with R.D. Burman as the music director. Rafi performed in numerous international concerts during the late 1970s including at the Royal Albert Hall and Wembley Conference Centre in London. The last song he recorded was ‘Shaam Phir Kyun Udaas Hai Dost’ for music director duo Laxmikant Pyarelal for the film Aas Paas. In December 1979, Rafi recorded six songs for the Hindi remake of Dilip Sen’s Bengali superhit Sorry Madam; the film was never completed due to a personal tragedy in Dilip Sen’s life. These songs, written by Kafeel Aazar and composed by Chitragupta, were released digitally in December 2009 by the label Silk Road under the title “The Last Songs”. The physical album was released only in India by Universal. 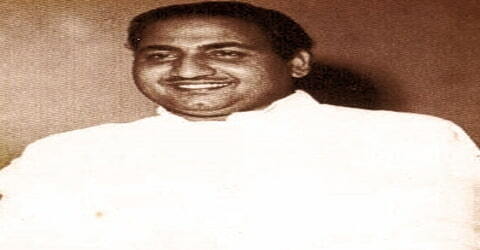 In 1967 Mohammed Rafi was awarded the Padma Shri, one of the Indian government’s highest civilian honors, for his contributions to the world of Indian cinema. Rafi received 21 Filmfare Awards nominations for playback singing out of which he won 6 times. He also won a National Film Award in 1977. He also bagged the Bengali Film Journalists’ Awards thrice in 1957, 1965 and 1966. Mohammed Rafi died of a massive heart attack on July 31, 1980, at the age of 55, at 10:25 PM at his residence, Mumbai, India. Rafi was buried at the Juhu Muslim cemetery. His funeral procession was joined by 10,000 mourning fans who accompanied him till the Juhu Muslim Cemetery where his mortal remains were laid to rest. A two-day public holiday was announced by the Government of India in his honor. In 2010, Rafi’s tomb along with many film industry artists such as Madhubala was demolished to make space for new burials. 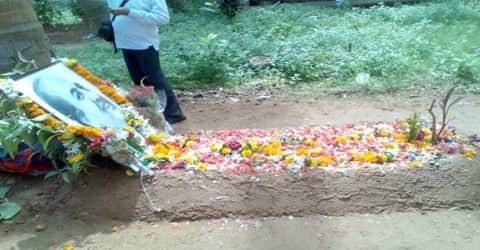 Fans of Mohammed Rafi, who visit his tomb twice a year to mark his birth and death anniversaries, use the coconut tree that is nearest his grave as a marker. 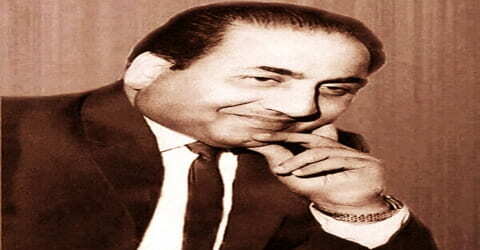 Hailed as the ‘Best Singer of the Millennium’, Mohammed Rafi was undoubtedly one of the best-known playback singers to have graced Indian cinema. A multiple award winner, he recorded thousands of songs over his career which was cut short by his untimely death. 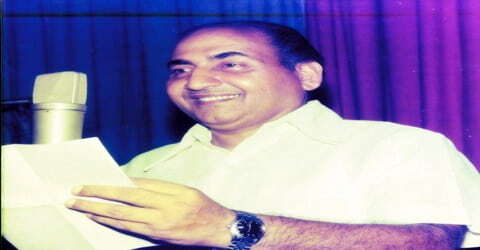 An official biography was written on Rafi’s life by Sujata Dev titled Mohammed Rafi – Golden Voice Of The Silver Screen launched on his 91st birthday. As well as an award-winning documentary titled Dastaan-E-Rafi directed by Rajni Acharya and Vinay Patel (which took 5 years to make) was released to commemorate his 92nd birthday which was later released on DVD. It featured over 60 interviews of various Bollywood personas and closely recalled his story through his songs and the personal recounts. Many biographies and documentaries continue to be written and made on him. During his last years, Rafi was involved in a controversy over Lata Mangeshkar’s entry in the Guinness Book of World Records. The Guinness Book of World Record published Lata Mangeshkar’s name as the artist recording the maximum number of songs. Rafi sent the Guinness authorities a letter challenging the fact and stating that he was the one who had sung a greater number of songs in comparison. The Guinness authorities did not take down the listing, but they amended it with the mention of Mohammed Rafi’s name and his contention. After Rafi’s death, in its 1984 edition, the Guinness Book of World Records gave Lata Mangeshkar’s name for the “Most Recordings” and stated, “Mohammad Rafi (d 1 August 1980) claimed to have recorded 28,000 songs in 11 Indian languages between 1944 and April 1980.” The Guinness Book entries for both Rafi and Lata were eventually deleted in 1991. In 2011, Lata’s sister Asha Bhosle was given the title.